Do you want to run your own startup, but unwilling to do so because you fear you don’t have any business or programming knowledge? I have seen many talented people who think running a business is not for them because they don’t have a fancy MBA degree. When I finished my Engineering few months back I want to start a web business, but I had absolutely zero knowledge about how to run a business. And I did my Engineering in Electronics and Communication which don’t have much to do with programming. But thanks to the internet I was able to find some websites which offers top quality courses for affordable fees or in most cases absolutely free. Those courses helped me to learn more about managing finances, handling employees, doing marketing, programming web apps etc. In this post, I am listing some of those websites, and I hope you will find it helpful. Note: These websites are not only for business and programming courses. They offer courses in many other subjects like literature, mathematics, biology, social studies, history etc. Among all learning sites this one is my favorite. Lynda.com is an online training library that offers a wide range of video courses on subjects such as business, developer skills, or on specific software. The video courses are taught by established industry professionals, so you can be confident that you are not getting 2nd rate instruction from a paid actor. I really enjoy the video courses and they take special care to explain every detail in a simple way. 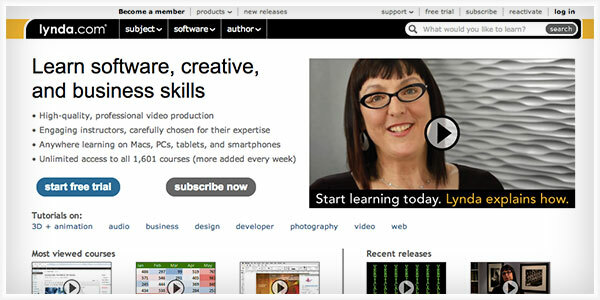 Lynda.com video courses primarily focus on teaching software skills, although it also has content for hobbyists (digital photography, for example), computer novices, and a wide array of subjects. For only $25 per month, you can access over 80,000 tutorials anytime with no long term commitment. Trust me it is worth your money. Coursera, founded by two Stanford professors, is an online platform for open-access, non-credit classes, available at no cost to audiences around the world. The Coursera courses consist of a series of short video lectures and presentations, as well as such additional elements as online quizzes and interactive discussion forums. They offer more than 325 free courses from 62 leading universities in the world. New course units will be released each week. Each unit consists of a set of video lectures, problem set and/or written assignments due the following week. Length of the classes is between 3 to 15 weeks. 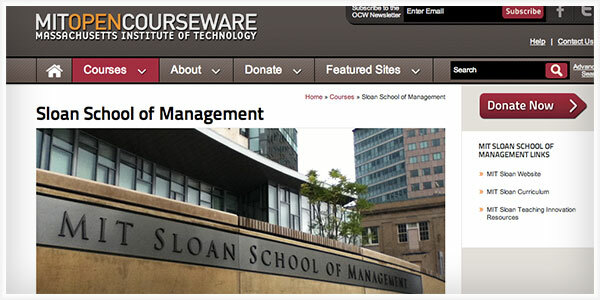 Venture Lab is an online platform used by Stanford University to offer free courses. Venture Lab’s philosophy is to make online courses more fun and engaging by making them more experiential, interactive, and collaborative. One of the major differences of Venture Lab from other educational sites is that , you will not only have access to lectures by Stanford professors, but you will also be able to form teams with people around the world and work on projects that have an impact. MIT OpenCourseWare (MIT OCW) is an initiative of the Massachusetts Institute of Technology (MIT) to put all of the educational materials from its undergraduate- and graduate-level courses online, and openly available to anyone, anywhere. The university’s initiative is to provide free and open access to its core academic content – the syllabi, lecture notes, problem sets and solutions, exams, reading lists, and even a selection of video lectures from over MIT 2,800 courses. Yes, everyone knows about iTunes. We use it for listening to music, for purchasing music and movies, to sync media with devices. But how many of you know that iTunes has a section called iTunesU that features educational audio and video files from universities, museums and public media organizations for free download to PCs and mobile devices. This includes courses from reputed universities like Stanford, UC Berkeley, University of Melbourne, Texas A&M, MIT, Yale, Trinity College Dublin and many more. 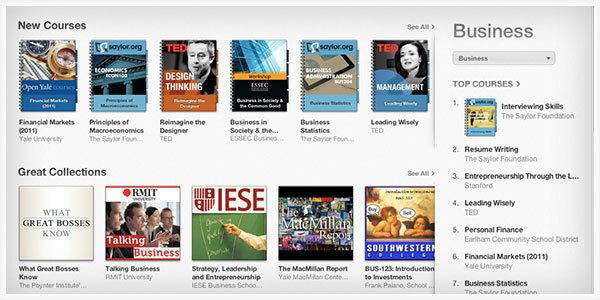 You can access iTunesU using iTunes desktop version or from iTunesU app for iPad, iPhone or iPod touch. Those are my favorite places for online learning. There are plenty of other websites and YouTube channels which offers top quality educational videos. But these 5 websites are a good place to start. Do you think online education is going to have a large growth? Which method you prefer – online learning or offline learning? Share your views as comments. Online learning is pretty fun. I always prefer it to the physical interaction classes. I signed up for Lynda but discontinued due to the lack of time. Now after reading this post you’ve reminded me to continue my studies. Great listing of some of the finest place to learn all about online business and the strategy that should be used when taking on the virtual world. I personally find Coursera to be simple and informative. Learnt a lot from there. And online learning will carve a niche for it in near future for sure. I like the blend of both of them though. Thanks for this cool piece of info. Will try the rest of them in near future. Thanks a lot for compilation and time and effort put on this article. As a new reader of your blog I am loving each and every moment spent on it over past 2 days. Wow, thanks for sharing these tools. 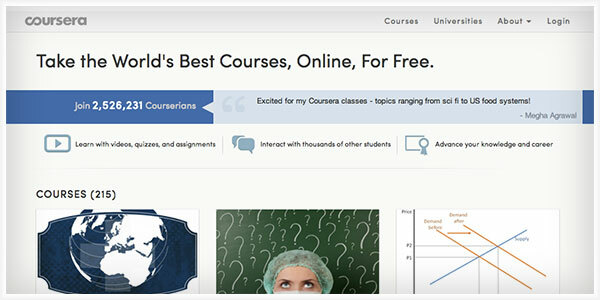 I didn’t know there were so many online learning options – especially not any for free. I’ll be sure to check that out as soon as possible, because I really would like to enhance the presentation of my website. I’m confident in my content. I just want things to look better on the design end, and hopefully I’ll find something very informative on one of the sites you listed. THANKS!